The concepts of top, middle, bottom can be found in all sorts of things in our daily lives. Take a look at these worksheets for some great examples! How about that great sub sandwich that’s so filling, the traffic lights you go through numerous times every day, or the snowman you build in the winter. 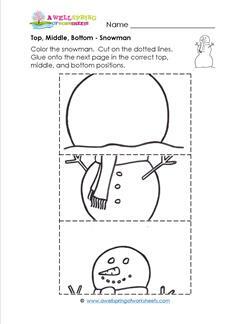 All the worksheets include cutting, gluing, and/or coloring. As kids put the objects together have them repeat the positional words, “top”, “middle”, and “bottom” while pointing to the correct position. Have a go at these stacked apples! 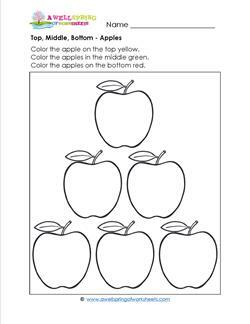 Color the top apple green, the middle apples yellow, and the bottom apples red, like a traffic light. Fill them in nice and full and make them yummy looking! Now we all know how a snowman is stacked - the big snowball on the bottom, the medium snowball in the middle, and the small snowball on the top. Have fun cutting and gluing! 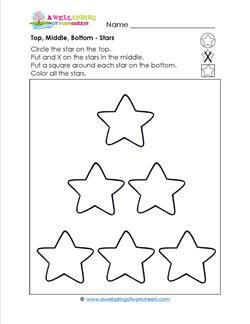 Put a circle around the top star, cross out the middle stars, and put squares around the bottom stars. Then comes the fun part. Color them all in whatever color you want! Now here's a good one! 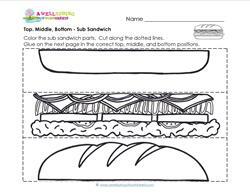 Cut and glue the parts to make a sub sandwich! The flat bread goes on the bottom, the fixin's in the middle, and the thick rounded bun on the top! We see them every day. 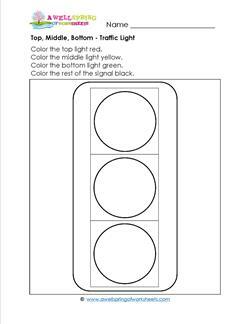 Can the kids remember which colors go on the top, middle, and bottom? Quiz them first! Color the top red, the middle yellow and the bottom green.